The British Embassy in Austria is located in the capital city of Vienna. The Embassy can issue visitor visas for those Austrians who wish to visit Britain, registration of British born in Austria and also normal consular services for those in Austria. We have listed their contact details below as well as a map and the street address in Vienna. 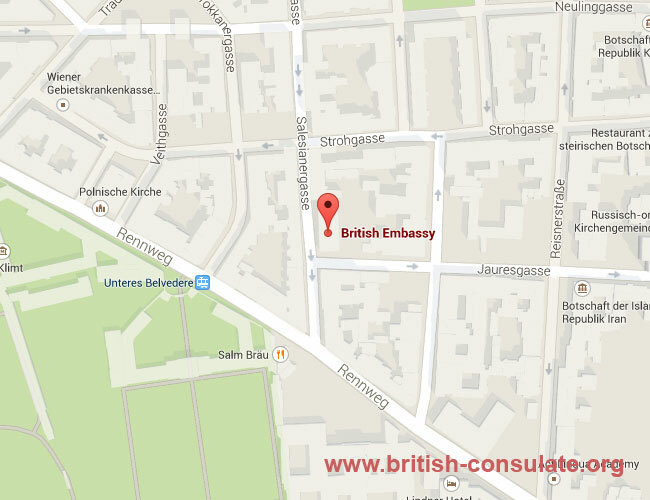 The telephone numbers for the British embassy in Austria has also been listed below. Note the operating hours for the Embassy which is also listed below. The British Embassy in Vienna is close on the followings days being public holidays in Austria. Like other embassies around the world the British embassy is closed on Austrian public holidays as well a British public holidays. You will note that the National Day of Austria the British embassy is closed while not a British public holiday in the United Kingdom. Check with the embassy before hand as the days do change on the calendar as this is the 2012 calendar of holidays in Austria. The following is the average times as recorded by the British government for the amount of British visas processed and also the time which it took to complete them. If you have a question about your documents for a British visa then contact the embassy at the contact numbers listed above to assist you with your visa application.